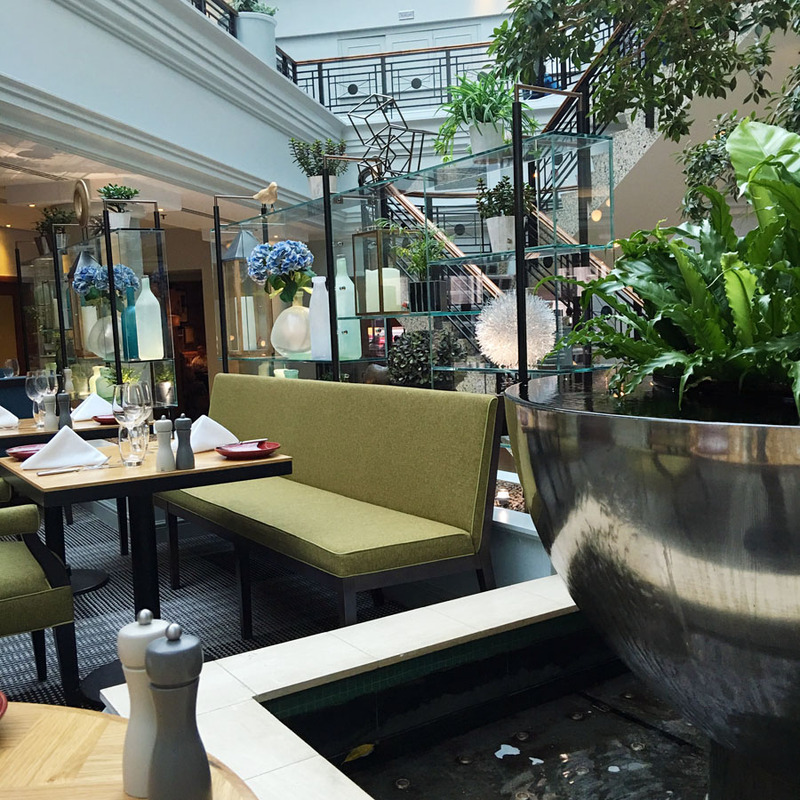 Located inside the luxurious Hyatt hotel, situated on Broad Street in the heart of Birmingham’s city centre, is the Aria restaurant. Serving high-quality cuisine in a contemporary designed open plan restaurant. 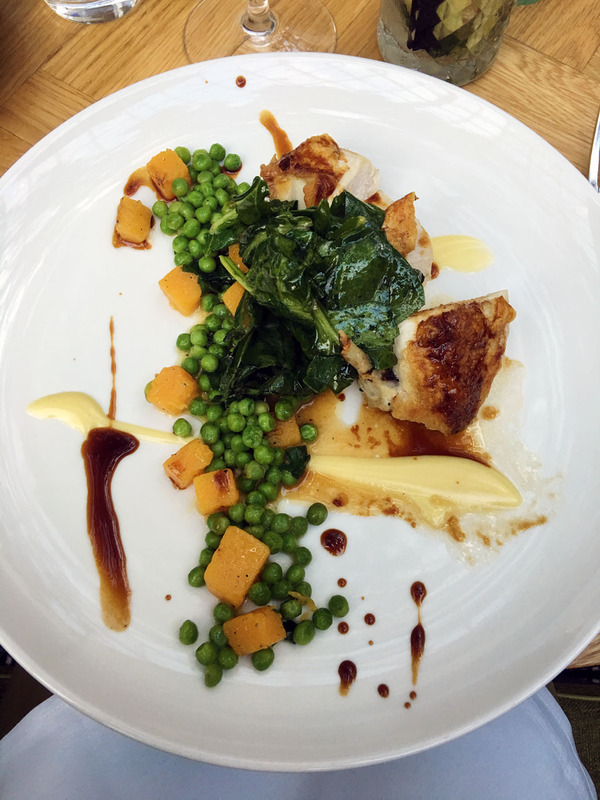 With two restaurants in the Hyatt Regency, the Aria is ideal for a cosmopolitan evening meal. 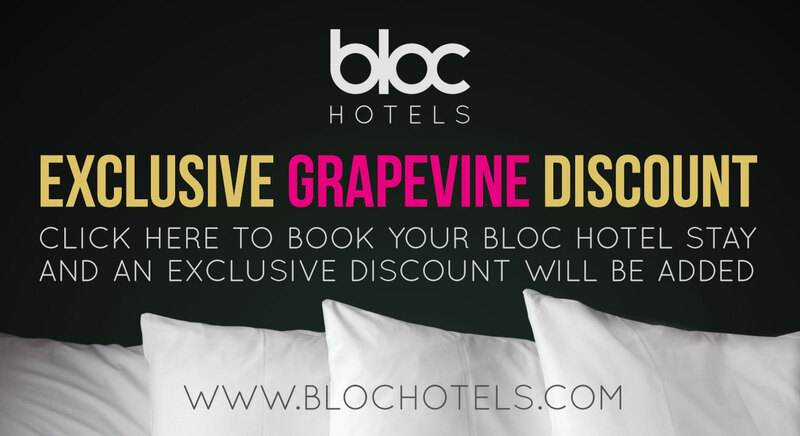 Positioned around the main lobby of the hotel, underneath a glass roof, it has an airy and relaxed atmosphere. The interior contains large trees, waterfalls and plants which create a warm elegance. Adding to the setting is a live band performing in the bar opposite the restaurant, their variety of modern covers is dynamic and gives the whole experience an electric ambience. The drinks on offer expand across a collection of fine wines, champagne and cocktails. 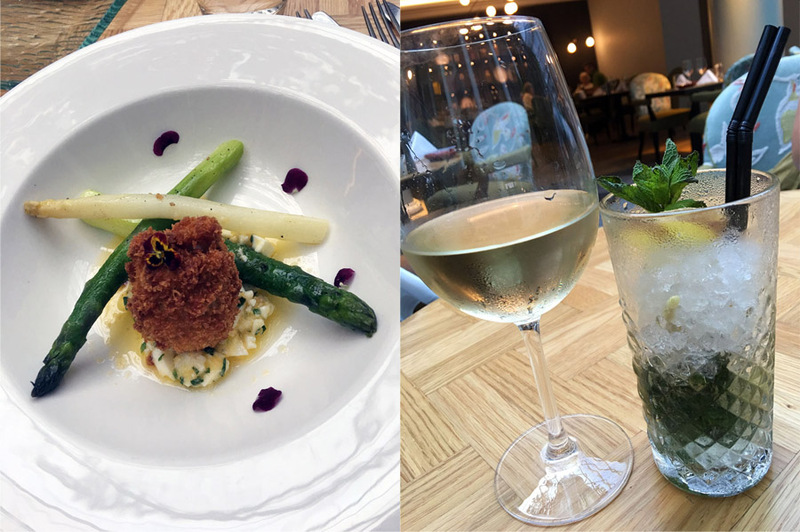 The cocktail menu has an agricultural theme running through them, with lots of plant based infused flavours such as lavender, mint and thyme. We ordered The Boultan cocktail which consists of gin, lemon grass, mint, ginger, agave syrup and ginger ale which were perfectly blended together to create a sharp, refreshing cocktail. 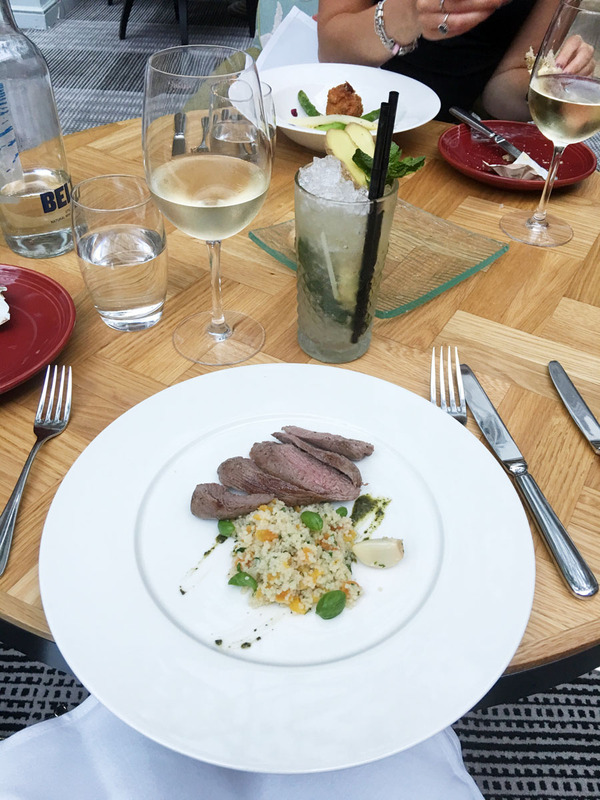 The menu provides a variety of succulent choices, all served with freshly prepared seasonal vegetables. To start we ordered the asapragus with duck egg yolk, which was essentially a posh scotch egg, an excellently sized starter that was presented beautifully. 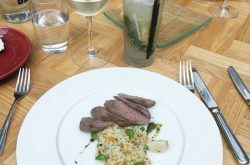 We also enjoyed the lamb fillet with apricot cous cous, the meat was tender and complimented well by the sweetness of the cous cous. 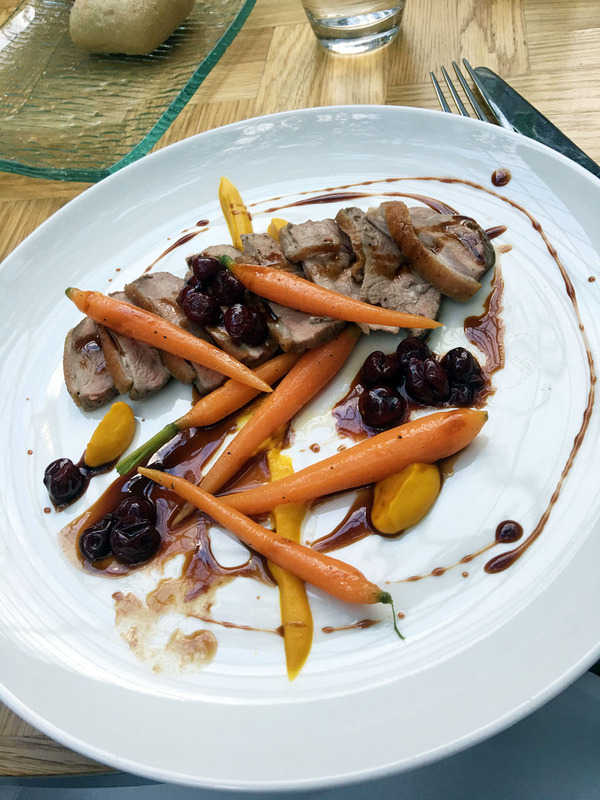 I was particularly impressed by the array of meat choices available for main courses, I tucked into the duck breast with chantenay carrots and cherries. 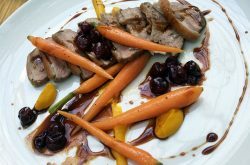 The duck was deliciously cooked with a slight crisp to the skin and the cherries provided a lavish flavour to the meat. 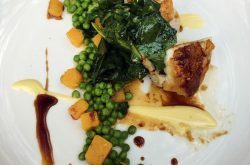 We also tasted the chicken breast with spinach, peas and butternut squash, It was a simple yet irresistibly tasty meal that was cooked with precision and it was displayed almost too beautifully to eat. 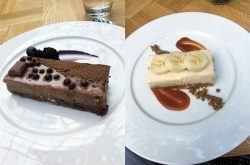 Despite the excellently filling first two courses, the dessert menu is bursting with luscious choices, it is difficult to resist. 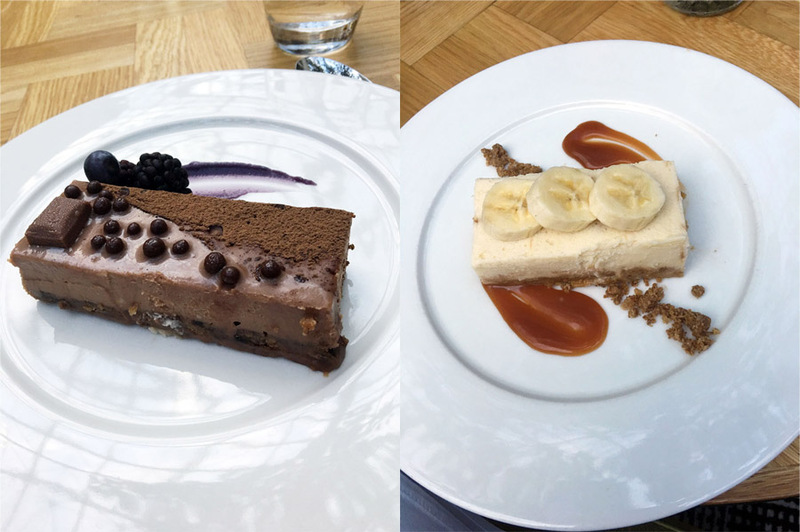 We settled on a banoffee cheesecake and a Cadbury cheesecake, which both satisfied the sweet tooth. The banoffee cheesecake had a sublimely creamy taste, which paired well with the crispy biscuit base. The Cadbury cheesecake was incredibly rich but the chocolate oozed out of the multitude of chocolaty layers. Our meal ended with a surprise shot of strong, yet heavenly limencello – a sensational finish to our dinner. With an exquisite setting and expertly crafted food, the Aria Restaurant provides a delightful dinner and tremendous evening. 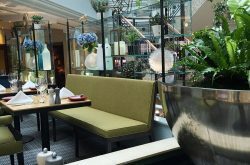 However, that isn’t all the Aria Restaurant has to offer, with a very reasonably priced pre-concert menu and afternoon tea, you can enjoy the stunning setting in a multitude of ways.